Summer sales! Check out my pretty buys. This beautiful, textured, drop-waist skirt from J.Crew is a steal! It was originally $80. In store, it was marked down to $35, and I got it for an additional half off. I posted the link below, and it comes in other colors too. This soft tank can be dressed up or down, and I got it for under $6 at the St. Augustine outlets with my mom on Wednesday! 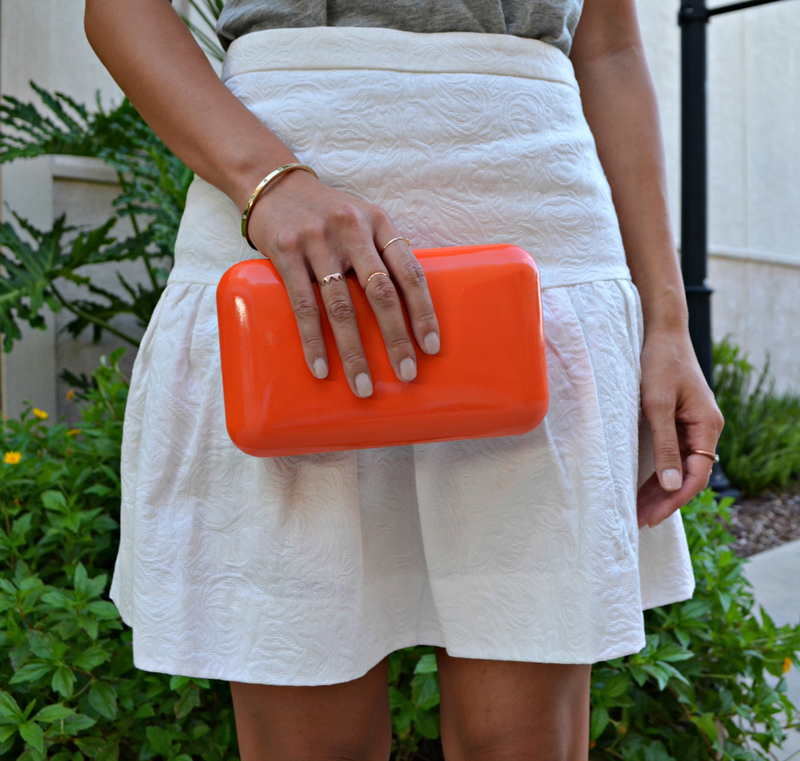 For a pop of color, I added a bright orange lip and clutch, which I got with a holiday discount on top of clearance at the J.Crew outlet during Memorial Day weekend. I got it for under $15! Love the gold hardware. I added some gold accessories. I've been loving my gold filled, hammered midi rings that are only $10 at LulaMae. Here is a close-up of the matelassé of the skirt! This type of stitching gives the fabric a quilted appearance. Wide perforated strap and mirrored block heel? Had to have these. Check ShoeMint out, especially when they offer $30 or $40 credits towards shoes! It brings the price down tremendously. These necklaces can be worn individually or with all three. So fun! For National Lipstick Day, I thought it was only appropriate to wear my favorite orange lipstick! :) To even out my complexion, I mixed Make Up For Ever HD Foundation in 170 with Stila Tinted Moisturizer in Warm, so that it wasn't too heavy on my skin in the heat. I dusted Too Faced Endless Summer 16 Hour Wear Bronzer all over and Nars Torrid Blush on the apples of my cheeks.